During my last few days aboard the Reuben Lasker before steaming to Bodega Bay for a small boat transfer on July 30th, we were fishing off of the southern Oregon coast. The ship continued to run the longitudinal transect lines using acoustics and collecting data using the continuous underway fish egg sampler (CUFES) during the day and performing targeted trawls for coastal pelagic species (CPS) at night. The weather and the pyrosomes picked up as we moved down the Oregon coast to northern California, but on what would turn out to be the last trawl of my trip in the early morning hours of July 28th, we had our biggest catch of the trip with over 730 kg in the net. Once again we saw 3 of the 4 CPS fish species that are targeted for the survey including the Pacific sardine, Pacific mackerel, and jack mackerel, but no northern anchovies were to be found. The science crew worked efficiently to process the large haul and collect the data that will be used to provide the Southwest Fisheries Science Center (SWFSC) with information that can be used to help understand the dynamics of CPS in the California Current. The data collected from the CPS fish species includes length and weight, otoliths (used to age the fish), gender and reproductive stage, and DNA samples. The information from these different parameters will provide the biologists at SWFSC with information that can be used to understand the nature of the different populations of the CPS fish species that are being studied. I am home now in southcentral Kansas, but as I am writing this, I can picture the science team beginning preparations for a night of trawling probably just north of Bodega Bay. By now (22:00) it is likely that a bongo tow and the conductivity, temperature and depth (CTD) probe samples have been collected providing data that will be used to calibrate and maximize the effectiveness of the acoustics for the area. Lanora and the rest of the team will have prepped the lab for a night of sampling, weather data will be recorded, and someone (maybe Nina or Austin) will be on mammal watch on the bridge. It all seems so familiar now; I hope the rest of the survey goes as well as the first half of the second leg. I will be thinking about and wondering how the science team of the Reuben Lasker is doing somewhere off the coast of California as I settle in for the night. 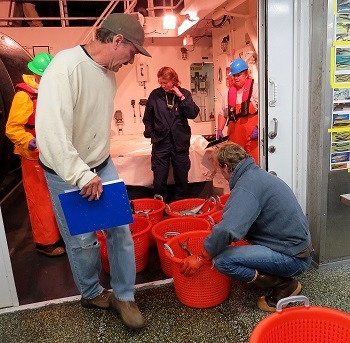 One thing I am sure of, after spending two weeks aboard the ship, is that the entire crew on the Reuben Lasker is working together, diligently, as a team, using sound scientific practices to produce the best data possible to guide decisions about the fisheries resources in the California Current. (0:01) Ok, we’re preparing to remove otoliths from a jack mackerel. It’s for the Coastal Pelagic Species survey on the Reuben Lasker, July 27, 2017. (0:22) We have Phil, from Washington Fish & Game, who’s going to walk us through the procedure. (0:30) The otoliths are essentially the fish’s ear bones. They help with orientation and balance, and also have annual rings that be used to age the fish. (0:48) And so the initial cut is – looks like it’s just in front of the operculum and about a blade-width deep. (1:01) And the secondary cut is from the anterior, just above the eyes and kind of right level with the orbital of the eyes, back to the vertical cut. (1:55) … and that is the left side. And that is very well done. Thank you Phil. I wanted to use a portion of this section of the blog to share some comments that were expressed to me from the members of the science team as I interviewed them before I left last week. The first “interview” was with Dave Griffith, the chief scientist for the survey. Dave was kind enough to provide me with a written response to my questions; his responses can be found below. Q1: Can you tell me a little bit about your background, including education and work history? Q1: I was born and raised in a small suburb of Los Angeles county called Temple City. Located in the San Gabriel valley at the base of the San Gabriel mountains, it was the perfect place to exercise the love and curiosity of the animals I could find not only in my backyard but also in the local mountains. It wasn’t until I reached high school that I realized I had a knack for sciences especially biology. This interest and appeal was spurred on by my high school teacher, Al Shuey. With little concept of a career, I continued on to a junior college after high school still not sure of my direction. Here I dabbled in welding, art, music and literature but always rising to the surface was my love of sciences. My fate was sealed. I entered San Diego State’s science program and was able to earn a bachelor’s degree and a master’s degree of science. For my dissertation I studied the re-colonization capabilities of meiofaunal harpacticoid copepods in response to disturbed or de-faunated sediments within Mission Bay. While studying for my masters, I was hired by Hubbs-Sea World Marine Laboratory as the initial group of researchers to begin the OREHAP project which is still operational today. The OREHAP project’s hypothesis was that releasing hatchery reared fish into the wild, in this case white seabass (Atractocion nobilis), would stimulate the natural population to increase recruitment and enhance the population. At the time the white seabass population numbers were at their all time low. During that time of employment at HSWML, I was also teaching zoology at SDSU as a teaching assistant in the graduate program. I was also the laboratory manager and in charge of field studies at Hubbs. My plate was pretty full at the time. I heard about the opening at the SWFSC through a colleague of mine that I was working with while helping her conduct field work for her Ph.D. at Scripps. I applied and was hired on as the cruise leader in the Ship Operations/CalCOFI group for all field work conducted within CFRD (now FRD) working under Richard Charter. That was 1989. I have now been the supervisor of the Ship Operations/CalCOFI group since 2005. My main objective on the Coastal Pelagic Fish survey as the cruise leader is to oversee all of the operations conducted by personnel from FRD during the survey. All scientific changes or decisions are made by the cruise leader using science knowledge, logic, common sense and a healthy input from all scientists aboard. I am the liaison between the scientific contingent and the ship’s workforce as well as the contact for the SWFSC laboratory. The expertise I bring out in the field is specific to fish egg identification, fish biology, field sampling techniques, knowledge of the California Current Large Ecosystem and sampling equipment. Q2: What have you learned from your time on the Reuben Lasker during the 2nd leg of the Pelagic Species Survey? Q2: First, that you never have preconceived ideas of what you expect to find. You always come out with knowledge of previous studies and a potential of what you might see, but the ocean always will show you and demonstrate just how little you know. When I was beginning in this career I was able to witness the complete dominance of a northern anchovy centric distribution change to a Pacific sardine centric distribution and now possibly back again. It’s mind boggling. I remember one of my colleagues, one of the pre-eminent fish biologists in the field, Paul Smith say to me during these transitions say, “Well, you take everything you’ve learned over the past 40 years, throw it out the window and start over again.” Yeah, the ocean environment will do that to you. Q3: What advice would you give to a 1st year college student that was interested in pursuing a career in marine science? Q3: Keep an open mind. Once you enter a four year university you will see areas of study that you never thought or believed existed. Have a concept of where you want to be but don’t ignore the various nuances that you see along the way. Go for the highest degree you feel capable of achieving and do it now because it becomes so much more difficult as you get older or the further away you get from academics if you begin working in a science position. And last, and I feel most important. Read. Read everything. Journals, magazines, classics, modern novels, anything and everything and never stop. Communication is such an incredibly important part of science and you need to have a command of the language. Not only is reading enjoyable but it will make you a better writer, a better speaker and a better scientist. I am back home in Kansas now after wrapping up my assignment on the Reuben Lasker and I have started to contemplate my experiences over the last couple of weeks. There are so many facets related to what I have learned during my time on the ship; the technology and mechanics of such a large research vessel are both fascinating and daunting at the same time. There are so many moving parts that all have to come together and work in a very harsh environment in order for the ship to function; it is a testament to the men and women that operate the boat that things operate so smoothly. As impressive as the technology and research is on the Reuben Lasker, it is the people that have made the biggest impact on me. You can see from Dave’s response above that there are some incredibly talented, dedicated individuals on the ship. I would like to share with you some of my observations about some of those people that I worked with including Dave Griffith. Dave is not only an outstanding scientist that has spent a lifetime making important contributions to fisheries science, he is also an incredibly well rounded person and an encyclopedia of knowledge. I would like to take this opportunity to personally thank Dave for his patience, and willingness to listen and provide insight and advice to me during my time on the ship. In my upcoming blog, I will provide more information about the other members of the science team that I had the pleasure to work with while on board. Until then please enjoy the pictures and video from my last week on the Reuben Lasker. After steaming north out of San Francisco, the Reuben Lasker arrived on location just south of Newport, Oregon early Wednesday (07/19) morning ready to begin the 2nd leg of the West Coast Pelagics Survey (WCPS). The survey is targeting coastal pelagic species (CPS). The Southwest Fisheries Science Center (SWFSC) uses the following characteristics to describe CPS. CPS have relatively short life spans, high reproductive potential, responsivity to climate change, schooling or swarming behavior, and inhabiting the upper or mixed layer of the water column (swfsc.noaa.gov/). The survey uses a combination of methods to try to locate the target species for sampling. The primary fish target species for the survey include Pacific sardine (Sardinops sagax), Pacific mackerel (Scomber japonicus), jack mackerel (Trachurus symmetricus), and the northern anchovy (Engrraulis mordax). In addition to these fish species, the market squid (Doryteuthis opalescens) is also included as a target species for the survey. These coastal pelagic species are critical to the ecology of the California Current pelagic ecosystem. A very important part of the survey involves using the acoustic trawling method (ATM) to locate and sample CPS. This method of sampling uses a systematic approach to help locate the target species that are being monitored. The area for the survey is laid out using a transect system. Transect lines (perpendicular to the coast) are latitudinal at 10 mile intervals and approximately 30-40 miles long. During the day, the ship follows these transect lines while using a continuous underway fish egg sampler (CUFES) and “listening” for CPS using some of the most advanced acoustics systems in the world. CUFES pulls water in from below the ship at a rate of 640 liters/ minute. As the water moves through the sampler it passes through a fine mesh filter that is continuously agitated. Any plankton or fish eggs that are larger than 505 microns are screened out, collected, and analyzed at 30 minute intervals. The CUFES requires constant monitoring and an experienced eye to be able to identify the various organisms in the sample. That responsibility falls on the shoulders of the lead scientists on the survey, Dave Griffith and Sue Manion. As this information is coming in it is entered into a computer that plots the results in relationship to the transect line that is being traversed. Of particular interest to the scientists on this survey are Pacific sardine eggs due to declining populations of this important forage fish over the last 10 years. Along with the CUFES data, the survey is being guided by a complex array of sonars and split beam eco-sounders. Dan Palance, is the ships acoustician. Dan monitors and collects data from 2 split beam echo-sounders, the EK60 and the EK80 and 3 multi-beam sonars, the MS70, ME70 and the SX90. As the ship moves down the transect line information from the eco-sounders and sonars is being monitored and analyzed. The images from the acoustics system provide insight into what types of fish or other marine organisms may be present near the transect line. Dan and the lead scientists use the data from CUFES and acoustics system to determine the best locations to trawl for the target species. Once the likely target areas are determined, the lead scientist will consult with the NOAA Corps officers to eventually determine where the boat will trawl. There is an incredible amount of information and data that is being generated to direct the survey. Each group of people involved bring their own unique skill set to the table, and communication between these groups is essential to the success of the survey. Once the location for sampling areas has been determined, a series of trawls will be conducted in those areas. The trawls are done at night to provide the best opportunity to catch the target species which are migrating up in the water column following the plankton species that they feed on. Since arriving on location we have been able to average 2-3 tows per night. The Reuben Lasker is equipped with trawl net (13 X 20 meter fishing mouth) with progressively smaller mesh as you move towards the cod end. The net is deployed behind the boat and fishes from the surface down to a depth of about 13 meters for 45 minutes. As the net is hauled back the excitement and anticipation about what may be inside grows. Over the course of the last 3 days we have found 3 of the 4 CPS fish species that are being monitored and market squid. The target fish species that we have seen so far include the Pacific sardine, jack mackerel, and Pacific mackerel. We have not found northern anchovies yet, but we have seen a variety of other marine organisms (listed below). Once the haul is collected from the net it is brought into the wet lab to be “worked up.” Everything that comes up in the net will be weighed and/or measured. In addition to weight and length measurements, gender is determined and DNA samples and otoliths are collected for the target fish species. Along with CUFES there is another process in place for collecting plankton using a “bongo net.” These paired nets are lowered into the water over the starboard side paying out 300 meter of cable before beginning the retrieval process. Once 300 meters of cable have been released the ship will set a speed to establish a 45O angle in the cable connecting to the bongos. As ship is underway the nets will be retrieved at of 20 meters/minute. Once at the surface the nets contents are washed down into a fine mesh collecting bag at the bottom of the net. This sample is preserved and will be analyzed to gain a better understanding of the planktonic community found in the water column. The data from the bongo nets is used to help calibrate the acoustics systems. The sampling protocol for the bongo nets has been well established and consistently followed for a long period of time leading to a reliable data set. There is also a system in place using a conductivity, temperature and depth (CTD) probe for collecting water chemistry data at regular intervals. The data collected from the various sampling methods is used to help direct the management of CPS in the California Current. As we push south down the Oregon coast the science team is settling into a routine and becoming more efficient at processing the hauls. I feel fortunate to be part of such an eclectic group of people. The team is made up seven members with a variety of backgrounds and experience, but all sharing the common goal of provide consistent, reliable data that can be used to help protect the ecological integrity of our oceans. In up-coming posts I hope to be able to provide a brief summary of the individual team members. I had my first opportunity to get a look at the Reuben Lasker when I arrived at the Exploratorium on Pier 15 in San Francisco (SF) on the 16th of July. My first impression was, this is a big, incredibly sophisticated research vessel. The boat has been in port for a few days as it prepares to leave for the 2nd leg of the West Coast Pelagics Survey. The first leg of the survey was conducted over the previous three weeks starting off of the coast of Vancouver Island and working down to the coast of Oregon. The vessel will be steaming out tomorrow (7/18/17) back to where the first leg was completed to begin the 2nd leg of the survey. The 2nd leg will begin near Newport, Oregon and continue down the coast of California finishing in San Diego on/or about August 11th. I am beginning to get to know the crew, which is made up of members of the NOAA Commissioned Officer Corps, civilian mariners and a science team. All of the crews are under the NOAA umbrella and work closely together. The NOAA Corps, and civilian mariners are responsible for the operation and maintenance of the boat while the science crew’s role is to design the survey, collect samples, record, and analyze the data for the project. There are 32 people on the boat, and I am amazed at the diversity of skills, education and background that is represented by everyone that is on-board. It is encouraging to know there are so many talented people involved in this type of research. In just the short time that I have spent on the ship I have gained a better understanding of the many opportunities that are available for students in marine science. As you might expect on a modern research vessel the technology is everywhere. There are multiple sonar systems, numerous sensors that record continuous environmental information, and the wheelhouse is equipped with an array of navigational systems and computers that link to sensors throughout the vessel. There are also the major mechanical components necessary to deploy and retrieve nets, gear, and various sensors. I am eagerly anticipating seeing how all of these pieces fit together once we begin sampling. Over the past 2 days while we have been in port, I have had a chance to explore the area around the dock and have found that NOAA is making a big impact on a global scale. As I was walking up to the ship I noticed a buoy in the harbor that was labeled with PMEL-CO2 (Pacific Marine Environmental Laboratory). Upon closer inspection I saw the NOAA symbol above the lettering and found an information plate on the rail describing the data the sensors on the buoy were collecting. This buoy and others like it moored across the world’s oceans are collecting information about CO2 levels in our oceans. The information is relayed to a satellite and then to a data center for analysis. The data collected by these buoys will help provide a better understanding of how rising CO2 levels are affecting our oceans. As I walked through the area surrounding the dock I found several more examples of research and educational programs that NOAA was supporting. NOAA’s commitment to sound science and support for educational programs like the Teacher at Sea program is making a difference in how people interact with the planet. I recently attended the Kansas Association of Teachers of Science (KATS) conference and listened to a very good presentation by Jeff Goldstein. One the things he said struck me as particularly important. He said, “Evidence based conclusions are important.” It is important that we don’t disregard and ignore information that is based on good scientific principles and analysis. My experiences over the last several days has given me a greater appreciation for critical role that NOAA plays in providing us with that information. The photos above are representative of my first few days in SF and on-board the Reuben Lasker.